If you were convicted of a crime from another country but would like to apply for Canadian citizenship, you may run into some complications. In order to the protect all Canadian citizens and permanent residents from any potential risks, Immigration, Refugees, and Citizenship Canada (IRCC) takes criminal convictions very seriously. If you want to become a Canadian citizen with a criminal record, you will need to be rehabilitated first. In this blog, you will learn about the process of applying for Canadian citizenship while having a criminal record. As previously mentioned, Immigration, Refugees, and Citizenship Canada (IRCC) takes criminal convictions very seriously. That being said, apply for Canadian citizenship while having a criminal record as a permanent resident can become challenging. Do not give up your hope, though. You may be eligible to apply from criminal rehabilitation which is the permanent solution to overcome your inadmissibility. Please note that Refugees, and Citizenship Canada (IRCC) has access to view criminal convictions from many years ago. This means even if a criminal conviction is from years ago, that criminal record can leave a negative impact on the individual in the future. For example, Immigration, Refugees, and Citizenship Canada (IRCC) may remove the permanent residence from the individual, if they find out that individual has a a criminal record. As a result, it is highly recommended that the individual must resolve the issue as soon as possible to avoid any negative consequences that may ensue in the future. It is important for you to know that applying for Canadian citizenship with a criminal record is never an easy process. If you have a criminal record, the application process and the decision of your citizenship application can be denied, delayed or placed on hold. As a result, there are several different things you should consider prior to applying for Canadian citizenship. For example, you should be aware of when the appropriate time is to submit your application for Canadian citizenship when you have a criminal record. Additionally, you need to provide adequate documentation and information to Immigration, Refugees, and Citizenship Canada (IRCC) to prove that you are a rehabilitated individual. Last but not least, you need to make sure you have properly filled out application forms for Criminal Rehabilitation. 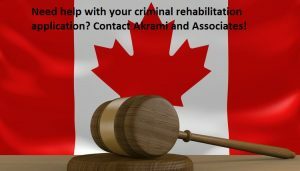 In order to overcome your inadmissibility and to maintain your permanent residency, you must first attempt to apply for a Criminal Rehabilitation. If you receive an approved Criminal Rehabilitation application, then that means you will no longer have criminal inadmissibility issues. If Immigration, Refugees, and Citizenship Canada (IRCC) is satisfied that have successfully overcome criminal inadmissibility, then they may allow you to maintain permanent residence in Canada. Unfortunately, the answer is yes. Even if your criminal convictions were pardoned, this may affect your Canadian citizenship application. It entirely depends on where the convictions were pardoned and whether or not those foreign pardons can be equated to Canadian pardons. Unless you have received a record suspension or a pardon that is recognized in Canada, you may run into complications with regards to your Canadian citizenship application in the future. As previously mentioned, Canadian government is very strict when it comes to assessing foreign travelers’ inadmissibility. In order to compile a strong criminal rehabilitation application, you will need to prepare for the correct documents. However, having to prepare all the required documents can very confusing and exhausting. It is also essential to note that this type of application is difficult to pursue on your own. Therefore, it is highly recommended that you seek out professional and experienced help prior to submitting the application. Akrami & Associates work and have experience with many different immigration matters. We have helped many of our clients create strong Criminal Rehabilitation applications. Please feel free to contact Akrami & Associates at 416-477-2545 for more information, or if you would like to book a consultation with an immigration professional for more advice. With Akrami & Associates, there is always a way!